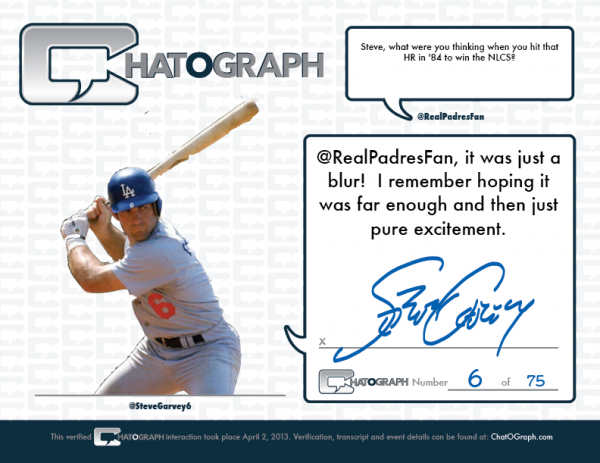 Baseball great and 10x All Star STEVE GARVEY will have a CHATOGRAPH™ engagement with fans to kick off our summer schedule! The Los Angeles Dodgers and San Diego Padres “Iron Man” will be be chatting and autographing your personalized CHATOGRAPH™ Transcript Certificates. Simply add this CHATOGRAPH™ by clicking on the Add to cart button above. Next, enter your user name and comment. Then hit submit and check out. It’s that easy. Check in when your CHATOGRAPH™ session is scheduled to see your reply!